Two years ago today we arrived in Canada as temporarily-homeless new immigrants. Well, not quite homeless as we still owned our old home in Manchester and were only two days away from taking possession of our house here. It's odd to look back over the last two years and reflect on what has changed in that time. A lot of the things on our list of 'things we want to do in Canada' seem to have been crossed off. Although Mike occasionally complains that he has never actually seen the 'to do' list. Which is clearly the right way to manage such things, I'm sure you'll agree. I feel that I ought to be writing something profound about our experiences at this juncture, but that is too difficult, so instead I will do what I normally do and stick to the pragmatic (and possibly mildly distasteful). One of the enduring mysteries of this house has been its waste-management system. 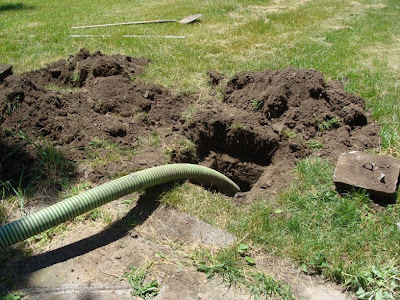 We sorted out the incoming water in various ways, but were never very clear about how to deal with the septic system that dealt with the outgoing variety. There was no obvious place from which to pump the waste out. Yesterday, with the help of one of our neighbours (who pushed us into doing something by calling in a firm who deal with septic tanks), this was sorted out. The well-hidden entry point to the septic tank was located and a big lorry pumped out the tank in a very short period of time. It won't need doing again for another three years or so. So that was another thing crossed off the list. But I'm sure that something else will come along soon and take its place. You have to love all things septic! At least you figured it all out and life will go on for another 3 years. We are in the middle of the same type of thing but our resolution is still to be had!